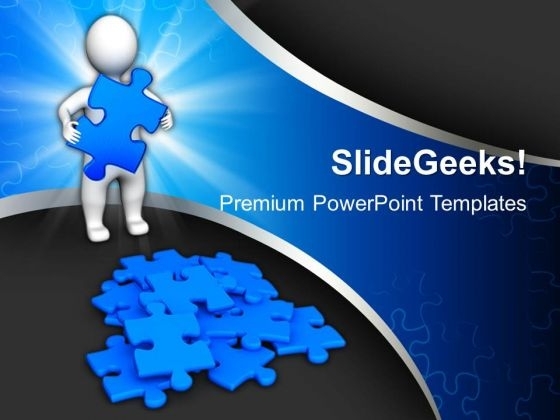 3D Man With Blue Puzzles PowerPoint Templates And PowerPoint Themes 1012-Create visually stunning Microsoft office PPT Presentations with our above template consists of 3d small person holding over blue jigsaw puzzle piece. This image represents the concept of found a solution. It is a useful captivating tool concieved to enable you to define your message in your Business PPT presentations. The structure of our templates allows you to effectively highlight the key issues concerning the growth of your business.-3D Man With Blue Puzzles PowerPoint Templates And PowerPoint Themes 1012-This PowerPoint template can be used for presentations relating to-"Man with blue puzzle piece, success, business, metaphor, people, finance" Help the audience digest your thoughts. Our 3d Man With Blue Puzzles PowerPoint Templates And PowerPoint Themes 1012 give you the facility. Flaunt it with our 3d Man With Blue Puzzles PowerPoint Templates And PowerPoint Themes 1012. Exhibit your ability without a care.